This is a photo of a heavily pregnant woman baring her baby bump for the full glare of the public. Good thing she even covered her brèast with bra. The motives behind this woman's dressing has been seriously questioned on social media. She could be arrested for indecent dressing in a place like The United Arab Emirates. 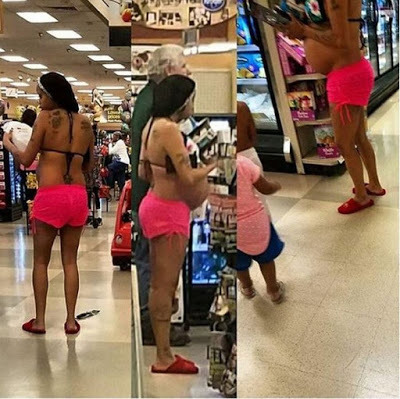 1 Response to "See What A Pregnant Woman Was Spotted Wearing In A Shopping Mall(Photos)"